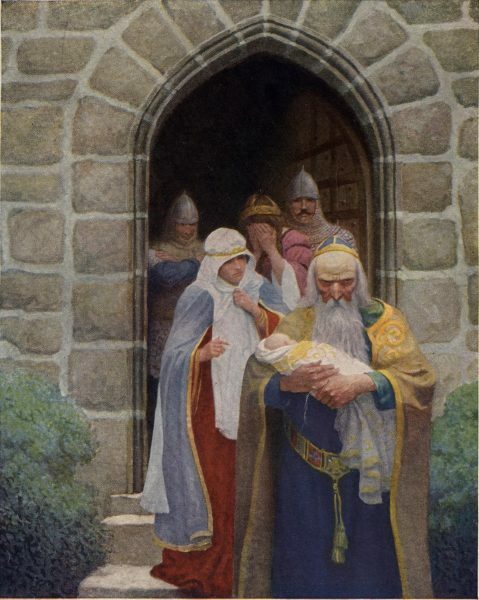 What is the most compelling image of the King Arthur legend? For me, it is the vision of young Arthur seeking a sword for his brother, and innocently withdrawing the sword from the anvil and stone, thus inheriting his destiny to be the next king. There are so many more archetypal images from the King Arthur legend. Those archetypes enchanted Britain and the rest of Europe through medieval times. Excalibur, Lancelot, Merlin and Camelot… they have all been the subject of stories and song, poetry and movies, right up to today. And why? It is because they reflect back to us the profound moments of transformation we each face in our lives. They are heroic stories. King Arthur saves a country. Merlin uses his magic to assist Arthur on his great mission. And the innocent Percival becomes the keeper of the holy grail. These are stories that put us in touch with our Primal Spirituality — our innate spirituality that is the innate connection we have with creative magic. 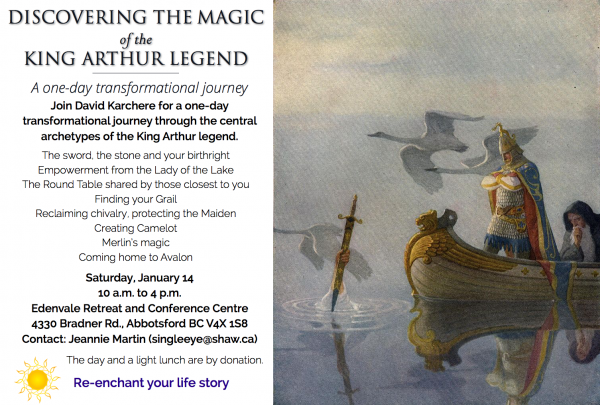 On Saturday, January 14, I have the privilege of leading a one-day workshop at the Edenvale Retreat and Conference Centre, Discovering the Magic of the King Arthur Legend. We will use story as an entry point to our own life story. 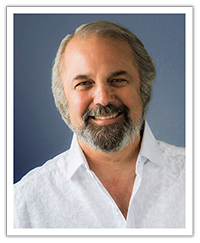 We will embrace our mission, own the magic of our own life, and discover what it means to find the holy grail – the sacred container in which our life transpires. Edenvale is in Abbotsford, British Columbia, an hour outside of Vancouver. My friend, Jeannie Matin is organizing the event. If you want to register, just e-mail her at singleeye@shaw.ca. The event includes a light lunch. Edenvale is offering it on a donation basis. One of the most persuasive historians I have read on King Arthur is Alan Wilson, who traces the historical Arthur to ancient Wales. But the are many versions of the “real” history behind the legend. My favorite King Arthur writer is Mary Stewart, a 20th century romantic mystery writer who became best known for her trilogy that told the story of Arthur from Merlin’s perspective. While historians disagree on the facts of the story, it has been the central archetypes that have captured the imaginations of people everywhere. Through the eyes of authors from Geoffrey of Monmouth in the 12th century to 20th century Jungian Psychologist, Robert A. Johnson, those archetypes have fascinated people from cultures around the world. As a child, my mother read me the King Arthur stories as told by American novelist and illustrator, Howard Pyle. The themes inspired my young heart – Arthur’s mission to unite a people and protect them, the knight’s commitment to protect the safety and honor of the fair maidens of the land. And the gift of Excalibur from the Lady of the Lake. This past October, I had the opportunity to visit ancient sites associated with the story. 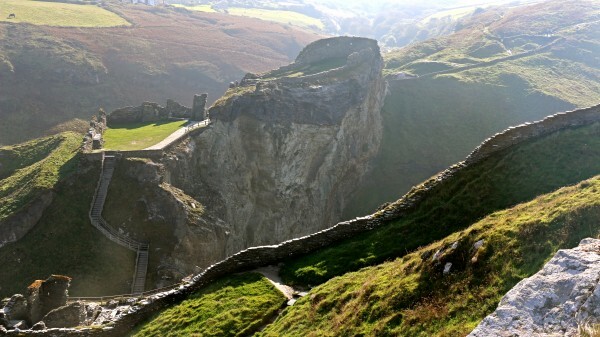 We saw Tintagel, where Arthur is conceived; Glastonbury, the site of Avalon; and Caerleon in Wales, once thought to be the site of the Round Table. With friends Ruth Buckingham and Phil Richardson, I am developing a tour of the sacred sites in Great Britain. It will be an opportunity to feel the magic of the story the landscape and ruins. And to experience the mystical empowering messages contained in the story. We will use the historical sites and the story itself to enter the mystical dimension of our human experience. It is here where life path is mutable; where we can alter the reality in which we have been living, change direction and become something other than what we have been. It is here that we can change the future. This Saturday will be the beginning of that journey. I hope you can join me. Thank you, David! We are so looking forward to experiencing this magical adventure at Edenvale! I go with you, David, in the exploration of the magical wonder of the story of truth, now, of King Arthur and the Knights of the Round Table at Edenvale . The story is alive in this day of the Kingdom. Archetypical speaks of the Archangel. Thank you. Dear David, what a great adventure your about to share with the lucky ones that will have the opportunity to join you in this fantastic story of noble life and quest for integrity. My enfolding spiritual presence will be present with you on this magical event ready to serve even II my body will be 5000 kilometers away. Much love and excitement to you for this amassing creative event.